Raisethe6% is our most important hashtag and the ethos of our entire project. 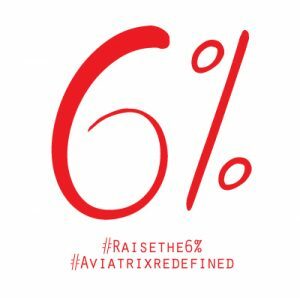 Only 6% of all aviators are women, and the Aviatrix Life project aims to change that number by illuminating the glamours life that is aviation. The 6% tag is a way to stamp a place in time and declare you are one of the few that chose a life in the air. One of those that chose to chase their dreams and make every fleeting moment staring at the sky a reality. #aviatrixredefined is entirely about redefining the perceptions the world has about what it means to be a female aviator. These tags all pertain to women in aviation specifically and have been used since the beginning of social media.